We’re going to milk today’s holiday for all its worth: it’s National Cereal Day! And also, Crown Roast of Pork day. It sounds like a royal pain to cook such an elaborate meal after a hard day at work, so we’re sticking with cereal – a great morning pick-me-up. Besides, who doesn’t love cereal? It’s the 3rd-most sold item in grocery stores, after soda and milk. I’m shocked that kumquats didn’t top the chart, but oh well. German immigrant Ferdinand Schumacher began grinding oats in the back of his store in Akron, Ohio, in 1854. This first oatmeal was a substitute for breakfast pork. I don’t understand why anybody would want less pork, but I guess the sausage market was no longer sizzling. Schumacher’s oatmeal was a hit, despite the fact that oats were traditionally viewed as “horse food.” Schumacher adopted the Quaker as his logo, and went to war against rival oatmeal manufacturers, until they all joined forces in 1888 to form Quaker Oats. At the turn of the 20th century, they figured out how to make puffed rice by shooting the kernels from guns. I have no idea if it snapped or crackled, but it sure did pop! Around the same time, the first breakfast cereal was invented by James Caleb Jackson. His creation, Granula, never caught on because the heavy bran nuggets needed to soak overnight before they were tender enough to eat. Ready to eat breakfast cereals came about because vegetarians wanted something non-meaty in the morning. Again: less pork? Really?? Members of the Seventh Day Adventist Church latched onto the vegetarian movement, and one of their headquarters – in Battle Creek, Michigan – soon became synonymous with cereal. John and William Kellogg, sons of a devout church member, owned a sanitarium there, and prescribed for their patients a regimen of fresh air, exercise, and a vegetarian diet. They experimented with a boiled wheat product that was rolled thin and flaked, and in 1895 patented Cornflakes cereal. Charles Post, a former sanitarium patient, created a rival product – Grape Nuts – in 1898, and the cereal war was on! To this day, Kellogg’s and Post remain rivals in the breakfast foods marketplace. Growing up, I was never into sweet cereals like many of my friends. 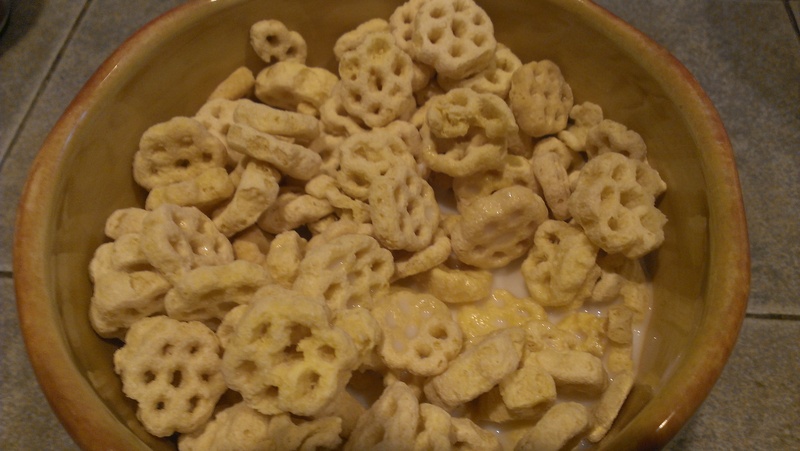 I preferred Rice Krispies and Special K. To celebrate today’s holiday, I had a bowl of Honeycombs, about as sweet a cereal as I’ll ever eat. Tara, unlike me, was a fan of sugary cereals like Cap’n Crunch and Golden Grahams growing up, and today she went for Cocoa Pebbles. Cereal is only good until it starts to become soggy. That’s what I was thinking when I read about Granula. Can you imagine soaking it overnight before eating? Times have changed!